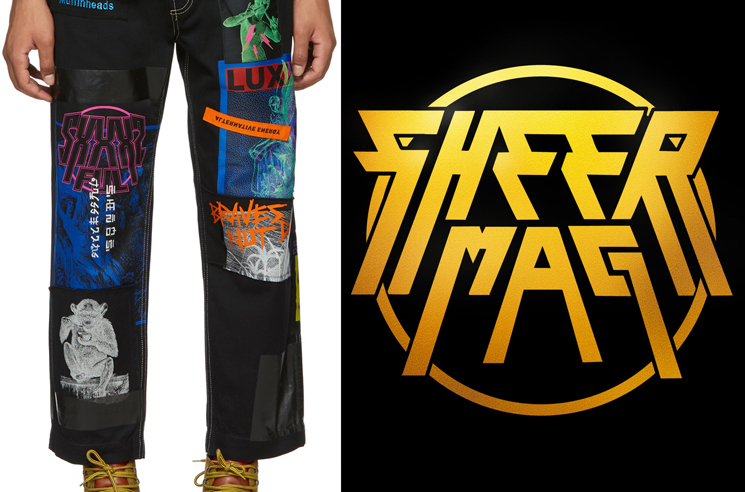 The intersection of fashion and music has led to plenty of artists having their logos ripped off by clothing companies, and it looks like Sheer Mag can now add their names to that list. As PunkNews points out, a pair of pants being sold by Diesel features a pink patch that looks strikingly similar to the Philly outfit's logo. You can find it above on the model's right leg. As Diesel writes in a product description for the Black P-Frank Patch Trousers, "the multiple jacquard and embroidered patches express Autumn-Winter's strong and empowering aesthetic, where post-punk influences meet a sporty, utilitarian attitude." If the logo ripoff wasn't enough, it should be mentioned that Diesel is selling the pants for just shy of $400 CAD. We think a "sporty, utilitarian attitude" can be achieved without paying that much, but that's just us. Sheer Mag will play in Toronto later this month as part of Not Dead Yet 2018.